The purpose of the Lawrence Berkeley National Laboratory (Berkeley Lab or LBNL) Electrical Safety Program is to specify the minimum requirements for identifying and controlling electrical hazards to prevent fatalities and injuries to personnel from working on or around hazardous electrical energy. The Electrical Safety Program is not just a document or set of documents. Instead, it is the living application of Integrated Safety Management (ISM) to electrical hazards and work on or around electrical equipment. The policy of Berkeley Lab is to implement the requirements of NFPA 70E, Standard for Electrical Safety in the Workplace, 2012 Edition. All electrical facilities and equipment shall be installed, operated, and maintained in a safe manner. All work involving electrical energy shall be performed in a safe manner. The primary safe work practice is to establish an electrically safe work condition. Electrical work shall only be performed by Qualified Electrical Workers, with approved equipment and PPE, using the Electrical Safe Work Practices outlined in this program. Management is accountable for ensuring that only Qualified Electrical Workers perform electrical work, and for ensuring that Qualified Electrical Workers have the required work planning, authorization, training, equipment, and PPE specified in this program. All personnel asked to perform electrical work have a duty to refuse if they are not qualified or if they feel they have not received the work planning and authorization, training and equipment, and PPE specified to perform the work safely. All personnel are asked to Stop Work in accordance with the Stop Work Policy in the event of any real or perceived imminent hazard. All electrical repair work shall be performed deenergized and in an Electrically Safe Work Condition, unless approved by an Energized Electrical Work Permit. Performing energized electrical repair work under an Energized Electrical Work Permit shall require additional justification and shall only be approved in extraordinary circumstances and as a last resort. No person shall be required, against his or her will, to perform energized repair work that requires an Energized Electrical Work Permit. Violation of these principles shall be reported immediately to line management, the Electrical Authority Having Jurisdiction (AHJ) for Safe Work Practices, or the Electrical Safety Committee. This document establishes the institutional Electrical Safety Program for Berkeley Lab. Specific electrical safe work practices are outlined in the Berkeley Lab Electrical Safety Manual. This program is required for all Berkeley Lab employees, affiliates, students, visitors, and subcontractors who may be exposed to hazardous electrical energy while performing any construction, service, research, maintenance, modification, or demolition activity. Persons performing work on projects or sites that do not fall under DOE jurisdiction are not required to follow the requirements of this program. However, an equivalent program meeting applicable regulatory requirements will apply. Delegated the Electrical AHJ from the Berkeley Site Office. Further delegates parts of these responsibilities to the proper managers and technical experts to develop and execute the Electrical AHJ programs. Assures that those individuals have the proper qualifications, and that they are formally designated with the proper responsibilities and authorities. Has final authority and responsibility to compel compliance to the requirements of 10 CFR 851. Delegated the Electrical AHJ from the Lab Director. Further delegates parts of these responsibilities to the proper managers and technical experts to develop and execute the Electrical AHJ programs. When necessary, adjudicating formal appeals to the Technical AHJ determinations, in accordance with the process identified in this document. Delegated limited authority to compel compliance on the part of the line management to any of the determinations made by the Technical AHJs. Enforces the code and the technical determinations of the Technical AHJs, to the extent allowed by this position and delegated authorities. Chairs the Electrical Safety Advisory Board (ESAB). Delegated the Electrical AHJ from the Deputy Laboratory Director for Operations. Providing for proper levels of staffing and resource for the Electrical Safety Program, and its promulgation through all Lab line organizations. Assuring proper integration of the Electrical Safety Program with other elements of the EHS division (e.g. training, assurance, etc.) and its promotion throughout the Laboratory. Subject to overall approval by the Deputy Laboratory Director for Operations, developing and executing risk-based prioritization efforts to mitigate non-compliant situations. Manages the Code Enforcement Unit, which includes the Technical AHJs for Electrical, Fire, and Building Code. Delegated the Electrical AHJ for Safe Work Practices from the EHS Division Director. Establishing, through the development and administration of the LBNL Electrical Safety Program the necessary policies, processes and procedures which provide effective assurance of these functions. Delegated limited authority to compel compliance to the above, specifically in cases where an imminent or expected/predictable/anticipated hazard represents unacceptable risk. Notifies DOE Berkeley Site Office (BSO), the Deputy Lab Director, and the EHS Division Director in writing of all approved equivalencies within 30 calendar days of such determination. Administers a Qualified Electrical Worker (QEW) approval and certification program for all individuals performing electrical work at the Laboratory. Reviews and approves all individual applications for status as a QEW 1, QEW 2 or QEW 3. Reviews and approves applications for Energized Electrical Work Permits, and maintains the associated database. Collaborates with the Electrical AHJ for Safe Installations and the Electrical AHJ for Unlisted Equipment to ensure that no gaps exist between the programs, and that overlaps and linkages are properly addressed. May delegate AHJ authority to qualified staff to cover during temporary absences. Delegated the Electrical AHJ for Safe Installations from the EHS Division Director. Administering an Electrical Installation Safety Program that provides assurance in the implementation of these requirements. This includes inspection and acceptance of all electrical distribution and premises wiring equipment, for both new construction and modification of existing equipment, and coordination with the Electrical AHJ for Unlisted Equipment for the field evaluation and approval of non-NRTL utilization equipment. Is delegated limited authority to compel compliance to the above, specifically in cases where an imminent or expected/predictable/anticipated hazard represents unacceptable risk. Notifies BSO, the Deputy Laboratory Director for Operations, the EHS Division Director and the Laboratory Electrical Safety Officer in writing of all approved equivalencies within 30 calendar days of such determination. Collaborates with the Electrical AHJ for Safe Work Practices and the Electrical AHJ for Unlisted Equipment to ensure that no gaps exist between the programs, and that overlaps and linkages are properly addressed. Delegated the Electrical AHJ for Unlisted Equipment from the EHS Division Director. Establish, through the development and administration of the LBNL Electrical Equipment Safety Program the necessary policies, processes and procedures which provide effective assurance of these functions. Notifies DOE Berkeley Site Office (BSO), the Deputy Laboratory Director for Operations, the EHS Division Director and the Laboratory Electrical Safety Officer in writing of all approved equivalencies within 30 calendar days of such determination. Collaborates with the Electrical AHJ for Safe Work Practices and the Electrical AHJ for Safe Installations to ensure that no gaps exist between the programs, and that overlaps and linkages are properly addressed. Provides executive-level support and advice to the Electrical AHJs. Provides critical review of proposed equivalencies. Provide the SAC with recommendations for training and requirements to implement the program. Provide the SAC with recommendations for funding of electrical safety initiatives. Develop and review technical material related to the Electrical Safety Program. In collaboration with the Laboratory Electrical Safety Officer, maintain, through review and revision, this Electrical Safety Program, the Electrical Safety Manual, and the technical electrical information in the Lockout/Tagout Program of the Berkeley Lab ES&H Manual. Assist line management in the interpretation of electrical safety requirements. Assist in employee training and safety awareness for electrical hazards. Assess the performance of the Electrical Safety Program, including assessments, audits, inspections, and reviews of electrical accidents and near misses. The ESC may also be requested to review electrical and electronic equipment and their installations at Berkeley Lab. Designates a Laboratory Electrical Safety Officer to maintain, administer, and revise the Electrical Safety Program as needed. Maintains Berkeley Lab specifications for installations of distribution and premises wiring. Maintains the arc flash incident energy analysis database for all Berkeley Lab distribution and equipment. Maintains up-to-date single-line drawings and panel schedules for all Berkeley Lab distribution and premises wiring. Maintains capacity to repair deficiencies in premises wiring and workplace conditions reported through the Work Request Center. Designates a suitably qualified individual to chair the Electrical Safety Committee (ESC). Maintains Berkeley Lab specifications for the design and build of research electrical equipment. Maintains capacity to repair deficiencies in research equipment reported through the equipment inspection process. Maintains the Electrical Safety Database for all records related to the Electrical Safety Program, including Qualified Electrical Worker (QEW) records, equipment inspection records, voltage glove testing records, electrical permits, and Lockout/Tagout (LOTO) permits and procedures. Ensures full implementation of the Electrical Safety Program through the EHS Assurance Program. Manages the Electrical Safety Program and the Electrical Safety Group. Delegated as Electrical AHJ for Safe Work Practices. Delegated as Electrical AHJ for Unlisted Equipment. In collaboration with the Electrical Safety Committee, revises the Electrical Safety Program document (this chapter) as needed. In collaboration with the Electrical Safety Committee, revises the Electrical Equipment Safety Program as needed. Maintains the Electrical Safety Manual. Provides subject matter expertise to Berkeley Lab in all areas of electrical safety. Selects and specifies appropriate safety tools and PPE for electrical work. Retains database copies of all approved AHJ equivalencies. Maintains NFPA 70E certification as Certified Electrical Safety Compliance Professional (CESCP). Performs deputy role for the Laboratory Electrical Safety Officer in the management of the Electrical Safety Program. Reviews and approves Electrical Safe Work Plans for the division. Performs annual work-practice audits of all QEWs within the division. Participates in annual division self-assessments in the areas of Electrical Safety and Lockout/Tagout. May be delegated as Electrical AHJ for Safe Work Practices or Unlisted Equipment to cover for temporary absences. Fulfill the function of “Competent Person” for R&D Facilities as required by NFPA 70E Article 350. In cooperation with the Laboratory Electrical Safety Officer, develop the Division ISM Plan for implementing the requirements of the Electrical Safety Program. Assist division line management in the enforcement of the Berkeley Lab requirements for electrical safe work practices and workplace conditions. Consult with the Electrical AHJ for Safe Work Practices for interpretation assistance as necessary. Review and approve Electrical Safe Work Procedures for the division. Perform annual work-practice audits of all QEWs within the division, and submit written reports to the Laboratory Electrical Safety Officer. Lead division annual self-assessments in the areas of Electrical Safety and Lockout/Tagout. Act as a resource to employees, managers, and Division Safety Coordinators for electrical safety-related concerns. Reinforce good work practices to reduce at-risk behaviors. Perform or assign workplace-condition inspections to look for electrical hazards in office, industrial, and/or laboratory spaces. Perform or assign surveys of electrical equipment, and enter non-NRTL equipment into the Electrical Equipment Database for inspection. Coordinate with the Electrical Safety Group to resolve issues with electrical workplace conditions. Are familiar with relevant resources including the Electrical Safety website, the Electrical Safety Database (QuickBase), and the Electrical Safety Manual. Perform routine workplace-condition inspections to look for electrical hazards in office, industrial, and/or laboratory spaces. Perform surveys of electrical equipment and enter non–Nationally Recognized Testing Laboratory (NRTL) equipment into the Electrical Equipment Database for inspection. Are familiar with relevant resources, including the Electrical Safety website, the Electrical Safety Database (QuickBase), and the Electrical Safety Manual. Only perform electrical work within the limits of qualification, using the required tools and PPE. Only perform work on electrical equipment that has been placed in an electrically safe work condition, unless proper authorization has been obtained and required controls have been established in accordance with this program. Where necessary, comply with the letter, intent, and prescribed sequence of all the steps and requirements listed in written procedures, such as Lockout/Tagout Procedures, Electrical Safety Work Plans, Switching Plans, and Energized Electrical Work Permits. Stop work and place the equipment in a safe state when questions arise in the implementation of any written procedure. Resolve the issue to everyone’s satisfaction prior to restarting work. Continually apply the ISM process in the performance of daily work activities. Satisfactorily complete all training and certification requirements necessary to maintain certification as a Qualified Electrical Worker. Seek out additional guidance or training for tasks that are performed less than once a year. Notify a supervisor of any condition that poses a potential hazard for which the QEW is not able to adequately analyze the hazard or develop controls. Immediately report any occupational injury or illness, including any electrical shock, regardless of how minor the shock is perceived to be, to their supervisor and to Berkeley Lab Health Services. Assist Non-QEWs in the performance of Lockout/Tagout of electrical systems, including the absence of voltage verification. Comply with all program requirements of the Electrical AHJ for Safe Installations and the Electrical AHJ for Safe Equipment. Ensure that each QEW reporting to the QEW supervisor is complying with the safety-related work practices required by this program. Assess the need for establishing, implementing, and maintaining procedures and/or work practices that will ensure the safe conduct of electrical work. Where required due to elevated hazards or increased complexity of the work, develop written electrical safe work plans and/or switching plans with step-by-step instructions. Coordinate with the EHS Electrical Safety Group or the Division Electrical Safety Officer (if assigned) to promote a culture of electrical safety in all facets of electrical work. Maintain a safe work environment and take corrective action on any potentially hazardous operation or condition. Ensure that approved, maintained, and tested PPE and clothing are provided, available, and used properly. Assign only trained and qualified employees to electrical work, and personally ensure that employees understand how to work safely by conducting a pre-job briefing as necessary. Administer the division’s Environment, Safety & Health (ES&H) program, including electrical safety. Work with supervisors and the EHS Electrical Safety Group to triage employees’ electrical safety risk exposures. Perform electrical safety walk-throughs to proactively identify electrical safety problems. Monitor division electrical safety program elements with emphasis on the risk exposures that have the most impact on staff. Collaborate with the Division Electrical Safety Officer or Advocate and the EHS Electrical Safety Group to provide effective coverage of electrical safety issues at multiple locations within each division. Enforces the Berkeley Lab requirements for electrical safe work practices and workplace conditions, unlisted equipment, and safe installations, including all technical determinations of the Technical AHJs. Ensures that all electrical-related incidents and injuries are reported appropriately. Ensures that all personnel who report receiving an electrical shock receive immediate professional medical evaluation. Ensures that only QEWs (or persons directly supervised by QEWs) perform electrical work. Ensures that QEWs receive the proper training, tools, and PPE necessary to perform their assigned work. Ensures that unsafe behaviors and unsafe conditions are corrected once they are identified. Report all electrical shocks and electrical-related incidents and injuries to line management. Report all unsafe electrical conditions, and ensure that they are repaired in a timely manner. Submit a Facilities Work Order Request if new, repair, or maintenance electrical work is needed (including installation of electrical outlets). Comply with the requirements of Section 5, General Electrical Safety for All Persons, of the Electrical Safety Manual. A dangerous condition associated with the possible release of energy caused by an electric arc. An organization, office, or individual responsible for enforcing the requirements of a code or standard, or for approving equipment, materials, an installation, or a procedure. At Berkeley Lab, the Electrical AHJ is formally delegated from BSO and is comprised of the Technical AHJs and the senior management officials in the delegation chain. Authority Having Jurisdiction (AHJ), Technical A properly qualified individual, formally delegated with the authority to select appropriate codes and standards, make technical determinations, and approve equivalencies. Technical AHJs include the Electrical AHJ for Safe Work Practices, the Electrical AHJ for Unlisted Equipment, and the Electrical AHJ for Safe Installations. A National Fire Protection Association (NFPA) certification for NFPA 70E, Standard for Electrical Safety in the Workplace. Deputy Laboratory Electrical Safety Officer A deputy to the Laboratory Electrical Safety Officer in the EHS Electrical Safety Group. Determination A final AHJ decision as to whether a part of the code applies or is satisfied in a particular situation. The Technical Authority Having Jurisdiction (AHJ) shall be permitted to select and apply the appropriate codes and standards to new facilities or modifications to facilities and/or processes; and to make day-to-day determinations on how to best satisfy the codes, standards, and specifications. Taking readings or measurements of electrical equipment with approved test equipment that does not require making any physical change to the equipment. Includes testing and troubleshooting. A designated competent Qualified Electrical Worker (QEW) is present on site and is providing oversight, guidance, and instruction on a specific task or set of tasks to another person. The degree of oversight required is dependent on the type and risk level of the task. Ultimately the QEW is accountable for the safe execution of the work. While shoulder-to-shoulder oversight is appropriate for an apprentice performing Zero Voltage Verification (ZVV), wiring practices could be more loosely supervised by a QEW in the same room as the person doing the wiring. A qualified electrical worker that is the division-level representative of the Electrical AHJ for Safe Work Practices. Power User Divisions are required to have a Division Electrical Safety Officer. A Non-QEW assigned by the division to perform tasks to support the Electrical Safety Program within the division. A general term, including fittings, devices, appliances, luminaires, apparatus, machinery, and the like used as a part of, or in connection with, an electrical installation. Electrical equipment can be classified as premises wiring or utilization equipment. A state in which an electrical conductor or circuit part has been disconnected from energized parts, locked/tagged in accordance with the Berkeley Lab Lockout/Tagout Program, tested to ensure the absence of voltage (ZVV), and grounded if determined necessary. A standing subcommittee of the Safety Advisory Committee (SAC) focused on Electrical Safety at Berkeley Lab. Any job or task that involves a shock or arc flash hazard or creates a potential for shock or arc flash hazards, energized or deenergized. Electrical Work requires a QEW. Tasks on equipment below the hazard thresholds of Table D-1 are not considered electrical work and do not require a QEW. An alternate method for a mandatory requirement that offers the same or greater protection from a hazard. The Technical AHJ is delegated the special authority to approve alternate methods when it is assured that equivalent objectives can be achieved by establishing and maintaining effective safety equal to, or exceeding, established codes, regulations, and standards. Capable of being inadvertently touched or approached nearer than a safe distance by a person. It is applied to electrical conductors or circuit parts that are not suitably guarded, isolated, or insulated. The amount of thermal energy impressed on a surface, a certain distance from the source, generated during an electrical arc event. Incident energy is typically expressed in calories per square centimeter (cal/cm2). A decision as to whether a part of the code applies or is satisfied in a particular situation. Any person with suitable knowledge (through training or experience) in the codes can make an interpretation. However, only the Technical Authority Having Jurisdiction (AHJ) shall be permitted to make a final interpretation, which is called a determination. The Laboratory subject matter expert on electrical safety. Assigned to manage the overall Electrical Safety Program and is delegated as Electrical AHJ for Safe Work Practices and the Electrical AHJ for Utilization Equipment. Manages the EHS Electrical Safety Group, the Lockout/Tagout Program, and the Electrical Equipment Safety Program. The method of applying a mechanical lockout device and a tag on an energy isolation by a LOTO Authorized Person in accordance with established procedures to control hazardous energies and prevent the equipment from being operated until the lockout device is removed. See ES&H Manual Lockout/Tagout Program. An OSHA-recognized organization that tests for safety; and lists, labels, or accepts equipment or materials. See OSHA 29 CFR 1910.7. A person who is not a Qualified Electrical Worker. Interior and exterior wiring, including power, lighting, control, and signal circuit wiring together with all their associated hardware, fittings, and wiring devices, both permanently and temporarily installed. This includes: (a) wiring from the service point or power source to the outlets; or (b) wiring from and including the power source to the outlets where there is no service point. Such wiring does not include wiring internal to appliances, luminaires, motors, controllers, motor control centers, and similar equipment. Power sources include, but are not limited to, interconnected or stand-alone batteries, solar photovoltaic systems, other distributed generation systems, or generators. A QEW applicant who has submitted the documentation supporting the appropriate level of knowledge and understanding but whose final approval is pending successful completion of all required safety training. The AHJ approves an applicant to PQEW status, and once all requirements are met the AHJ approves the applicant as a QEW. A QEW who is also a work lead, activity lead or supervisor, providing daily supervision to a QEW or group of QEWs. The QEW supervisor must be of the same level or higher than those supervised in order to direct specific electrical aspects of the work. Any physical alteration of electrical equipment (such as making or tightening connections, removing or replacing components, etc.). An overall process that identifies hazards, estimates the potential severity of injury or damage to health, estimates the likelihood of occurrence of injury or damage to health, and determines if protective measures are required. As used in this manual, arc flash risk assessment and shock risk assessment are types of risk assessments. A hazard control measure that is more stringent than the Standby Person. The Safety Watch must be implemented when there are grave consequences from failing to follow safe work procedures. The Safety Watch is a Qualified Electrical Worker (QEW) whose only duty is to monitor the work of another QEW. Set of tasks for which a Qualified Electrical Worker is fully competent and can perform without additional planning or supervision. These vary depending on the individual’s experience, job position description, and routine daily work assignments. A second person designated to fulfill the requirements of accompanying a Qualified Electrical Worker (QEW) performing certain types of high hazard electrical work. While the primary purpose of a second person is to initiate the emergency response system, a Standby Person is also expected to know how to deenergize electrical equipment and to safely release a QEW from contact with energized parts. The manual operation (opening or closing) of any electrical isolation on energized equipment. Manual operation includes the operation of through-the-door breaker handles or other dead-front switching. Equipment that utilizes electric energy for electronic, electromechanical, chemical, heating, lighting, or similar purposes. An exception to compliance with some part of a safety and health standard granted by the Under Secretary of DOE to a contractor. Variances are treated under 10 CFR 851 Subpart D and can only be granted by the DOE Under Secretary after considering the recommendation of the DOE Chief Health, Safety and Security (HSS) Officer. The authority to grant a variance cannot be delegated to Berkeley Lab. Intentionally coming in contact with energized electrical conductors or circuit parts with the hands, feet, or other body parts, with tools, probes, or with test equipment, regardless of the personal protective equipment (PPE) a person is wearing. There are two categories of “working on”: diagnostic and repair (see definitions). The process of verifying that all potentially energized electrical conductors or circuit parts are deenergized. Involves the use of a live-dead-live check of a voltage tester. ZVV is used together with Lockout/Tagout to establish an Electrically Safe Work Condition. This program includes both the institutional requirements for the overall Electrical Safety Program and the detailed requirements for the Electrical Safe Work Practices functional area of the program. Flow-down of roles and responsibilities for Electrical Installations and Electrical Unlisted Equipment are described separately. The Electrical Safety Program is a Berkeley Lab institutional program and is owned by the Laboratory. The Electrical Safety Committee (ESC) represents the Laboratory in this function. The ESC is a standing subcommittee of the Safety Advisory Committee (SAC). The ESC assists the Laboratory Electrical Safety Officer in maintaining the Electrical Safety Program and providing direction for continuous improvement. The Electrical Safety Program is managed in Berkeley Lab’s Environment/Health/Safety Division by the Laboratory Electrical Safety Officer (Laboratory ESO). Managing the Berkeley Lab Electrical Equipment Safety Program (EESP) on behalf of the Electrical AHJ for Safe Equipment. The Deputy Laboratory Electrical Safety Officer works in the EHS Electrical Safety Group and reports to the Laboratory ESO. The Deputy Laboratory ESO performs deputy functions for the management of the Electrical Safety Program and all responsibilities assigned to the Electrical Safety Group. The Deputy Laboratory ESO provides additional support for divisions that are not required to have a Division Electrical Safety Officer in accordance with Work Process C of this program. When the term “Electrical Safety Officer” is used generically, it means either the Laboratory ESO, the Deputy Laboratory ESO, or a Division ESO. The responsibility for electrical safety flows down to each individual worker through line management. Each division is responsible for implementing the requirements for Safe Work Practices as described in this ES&H Manual program. More information about the Electrical Safety Program can be found at the Electrical Safety Website. The Electrical Authority Having Jurisdiction (AHJ) is defined by the National Fire Protection Association (NFPA) as an organization, office, or individual responsible for enforcing the requirements of a code or standard, or for approving equipment, materials, an installation or a procedure. Since the Department of Energy (DOE) is self-regulating, the AHJ authority for Berkeley Lab is ultimately derived from DOE. The AHJ authority has been formally delegated from the DOE Berkeley Site Office (BSO) to the Lab director, who has then formally delegated various roles and responsibilities to specific individuals through a chain of letters of delegation. See Appendix A of this program for links to the Electrical AHJ Delegation Letters. The EHS Division Director has further delegated the Electrical AHJ authority to qualified individuals known as the Technical AHJs, splitting the duties among three areas of jurisdiction. Administering an Safe Electrical Installations Policy that provides assurance in the implementation of these requirements. This includes inspection and acceptance of all electrical distribution and premises wiring equipment, for both new construction and modification of existing equipment, and coordination with the Electrical AHJ for Unlisted Equipment for the field evaluation and approval of non-NRTL utilization equipment. Establish, through the development and administration of the Electrical Equipment Safety Program, the necessary policies, processes and procedures which provide effective assurance of these functions. By definition, the purpose of the Electrical AHJ is to enforce the applicable codes and standards. The enforcement role is split between the senior managers in the AHJ delegation chain, who hold either the positional or the delegated authority to compel compliance (enforce), and the Technical AHJ’s, who make the technical determinations on code compliance. Together these individuals comprise the overall Electrical AHJ management chain that is responsible for the full institutional enforcement of those codes by the Laboratory. Line management holds people accountable to implement the codes and standards, including all determinations made by the Technical AHJs, through traditional line management functions. The Electrical AHJ does not share this role, but rather relies on Line Management for this to happen. It is therefore very important for line management to fully understand and support the Electrical AHJ functions, authorities and limitations for the program to be effective. In all cases the Technical AHJ retains the authority to direct specific actions as necessary to correct unsafe conditions or behavior. Where such action is required, it shall be followed up with a briefing of line management detailing the issues encountered, immediate actions taken and longer-term corrections required to prevent recurrence. All Technical AHJ delegations within Berkeley Lab require review and concurrence from the BSO Manager. The individual(s) selected for fulfilling the Technical AHJ role must possess such executive ability as is required for performance of the position, and should have thorough knowledge of standard materials and work practices used in the installation, operation, construction, and maintenance of electrical equipment. The Technical AHJ must, through experience or education, be knowledgeable of the requirements contained in 10 CFR 851, OSHA 29 CFR 1910 and 1926, NFPA 70 (NEC), NFPA 70E, DOE requirements, and other appropriate local, state, and national standards. The Technical AHJ must be capable of interpreting codes, regulations, and standards, and approving equipment, assemblies, materials, or procedures. If the Technical AHJ needs to address items outside their electrical expertise, such as fire, confined space, fall protection, or like issues, the AHJ must consult with cognizant experts before a decision is reached. Secondary codes and standards. Some of the code and standards reference additional, i.e., secondary, standards. Berkeley Lab is required to comply with secondary standards that are applicable to identified hazards. The primary standards that reference secondary standards usually state how these secondary standards are to be used. Similarly, mandatory provisions of secondary standards have the same force and effect as primary cited standards. Secondary standards also include references to other codes and standards that provide additional information on particular topics but are not mandatory requirements. Those other codes and standards are not required. Certain codes and standards provide implementation flexibility in the form of “Code of Record.” Code of Record refers to acceptability of the code that was in effect at the time a facility or item of equipment was designed and constructed rather than the current code or standard. The appropriate version of a Code of Record is the version that was in effect when approvals were obtained for the phase of the project for which the code applied, regardless of the duration of the project. Revised codes do not supersede previous codes for phases of the project that already have been approved. The Code of Record provision applies to electrical equipment and installations. However, it does not apply to electrical safe work practices and workplace conditions. See Appendix B of this program for the Code of Record tables. A variance is an exception to compliance with some part of a safety and health standard granted by the Under Secretary to a contractor. Variances are treated under 10 CFR 851 Subpart D and can only be granted by the DOE Under Secretary after considering the recommendation of the DOE Chief Health, Safety and Security (HSS) Officer. The authority to grant a variance cannot be delegated to Berkeley Lab. The process to obtain a variance is found in Variance from Berkeley Lab ES&H Policies, in the Berkeley Lab Requirements and Policies Manual (RPM). An equivalency is an alternate method for a mandatory requirement that offers the same or greater protection from a hazard. Only the Technical AHJ may approve alternate methods when it is assured that equivalent objectives can be achieved by establishing and maintaining effective safety equal to, or exceeding, established codes, regulations, and standards. As a condition of this delegation from BSO to Berkeley Lab, all AHJ equivalency approvals shall be documented and forwarded to BSO for review within 30 calendar days of such determination. The Laboratory Electrical Safety Officer shall retain database copies of all approved equivalencies. An interpretation is a decision whether a part of the code applies or is satisfied in a particular situation. Any person with the proper knowledge of the codes may make interpretations. A determination is a final interpretation by the Technical AHJ. Only the Technical AHJ is delegated the authority to make a determination. AHJ implementing processes and procedures shall maintain the independence of the Technical AHJ from scope, schedule, or budget constraints. AHJ implementing processes and procedures shall maintain the independence between the design and the approval of any installation, equipment, or safe work procedure. The Technical AHJ shall be required to identify violations of applicable codes and standards and shall not be required to develop solutions that meet project constraints. While the Technical AHJ can participate in discussions related to solution development, this participation shall be purposefully limited to prevent compromising the independence between design and approval. The authority of the Technical AHJ is limited by their jurisdiction. The Technical AHJ shall not render interpretations or equivalencies, nor shall the Technical AHJ be responsible for enforcing any code or standard, for areas outside of their jurisdiction. For installations and equipment, the jurisdiction of the AHJ extends to all installations and equipment that within the physical boundaries of Berkeley Lab, unless explicitly identified as exceptions in the Safe Electrical Installations Policy. Equipment that is being constructed for use at Berkeley Lab shall also be in the jurisdiction of the AHJ. For electrical safe work practices and workplace conditions, the jurisdiction of the AHJ extends to all persons performing work under the Berkeley Lab Worker Safety and Health Program (PUB-3851), including the flow-down to subcontractors. Jurisdictional boundaries between the three Technical AHJs may sometimes be unclear. In these situations, the Technical AHJs will discuss the particulars and agree which AHJ will have jurisdiction. In some cases, the Technical AHJs may decide to hold joint jurisdiction over various parts of the same process. This is particularly evident in the initial energization of new buildings, where all Technical AHJ’s will have to concur prior to approving initial energization. The AHJ shall be permitted to select and apply the appropriate codes and standards to new facilities, or modifications to facilities and/or processes. The AHJ shall be permitted to make day-to-day final interpretations (determinations) on how to best satisfy the electrical mandatory codes and standards identified in 10 CFR 851. The AHJ may permit alternate methods when it is assured that equivalent objectives can be achieved by establishing and maintaining effective safety equal to, or exceeding, established codes, regulations, and standards. As a condition of this delegation from BSO to Berkeley Lab, all AHJ equivalency approvals shall be documented, and BSO will be given notice within thirty (30) calendar days of such determination. The Electrical AHJ shall retain database copies of all approved equivalencies. The AHJ shall enforce the Berkeley Lab specifications for electrical safe work practices, electrical installations and equipment design. The AHJ shall be permitted to delegate to other qualified individuals such powers as necessary for the proper administration and enforcement of mandatory codes and standards. This does not include the authority to approve equivalencies. The AHJ shall be permitted to require plans and specifications to ensure compliance with mandatory codes and standards as well as Lab specifications. The AHJ shall be authorized to inspect, at all reasonable times, any building, premises or equipment for dangerous or hazardous electrical conditions or equipment. The AHJ shall be permitted to order any person(s) to remove or remedy such dangerous or hazardous electrical condition or equipment. Whenever any installation subject to inspection prior to use is covered or concealed without having first been inspected, the AHJ shall be permitted to require that such work be exposed for inspection. Where the AHJ deems that conditions hazardous to life and property exist within their jurisdiction, he or she shall require that such hazardous conditions be corrected. The AHJ shall be permitted to direct individuals in the field to take certain specific actions necessary to correct unsafe conditions or behavior. Where there is disagreement over the AHJ direction, the AHJ shall issue a formal stop work until resolution is attained. The AHJ shall be permitted to order the immediate evacuation of any occupied building deemed unsafe when such building has hazardous conditions that present imminent danger to building occupants. When the use of any electrical equipment or its installations is found to be dangerous to human life or property, the AHJ shall be empowered to have the equipment or premises disconnected from its source of electric supply. The AHJ shall be permitted to investigate the cause, origin, and circumstances of any fire, explosion, or other hazardous condition. The appeals process shall not be used as a substitute for following codes, specifications or the AHJ implementing processes and procedures. The primary function of the Technical AHJ is to provide clarity in the application of complex codes and standards and to apply professional engineering judgment to specific situations. Different outcomes are naturally expected to occur when individual Technical AHJ’s in separate jurisdictions apply their professional engineering judgment to specific situations. This alone should not be cause for an appeal. The true intent of the mandatory codes or standards has been incorrectly interpreted. The provisions of the mandatory codes or standards do not fully apply. Submission of Appeals. A written appeal, outlining the mandatory code or standard provision from which relief is sought and the remedy proposed, shall be submitted to the AHJ within 15 calendar days of notification of violation. The appeal shall state the basis for the appeal in accordance with the conditions in paragraph c.
Review of Appeals. Upon receipt of such appeal, the Deputy Lab Director for Operations shall determine whether, prima facie, the appeal has merit under the conditions in paragraph c. The Deputy Lab Director for Operations shall convene a hearing for such appeals with the Technical AHJ’s and the Electrical Safety Committee and proceed to determine whether the action of the Technical AHJ complies with this Program and, within 30 calendar days after receipt of the appeal or after holding the hearing (whichever is later), shall make a decision in accordance with its findings. Every electrical job requires an appropriate level of electrical hazard analysis, work planning, authorization and direct field supervision that is commensurate with the risk level of the job. The Integrated Safety Management (ISM) system applies in full to electrical work. The general process for implementing ISM can be found in PUB-3140, Integrated ES&H Management Plan, including the seven guiding principles and the five core principles. To prevent and mitigate hazards, controls must be tailored to the work being performed, the risk of harm posed by the work, and the extent or degree of harm that could occur while performing the work. Elimination or substitution of the hazards: In the design of equipment or apparatus, careful consideration should be made when applying hazardous electrical power to a device. For example, control and interlock circuitry could be designed to operate at 24 VDC instead of 120 VAC. Engineering controls: In the design of equipment or apparatus, permanent guarding, enclosing, or insulation of hazardous voltage sources are engineering controls used to prevent unnecessary exposure to the operator. Administrative controls: Implementation of an electrically safe work condition (Lockout/Tagout), restricted access to qualified electrical workers, and documented safe work plans are examples of administrative controls. Personal protective equipment (PPE): Working on energized equipment while protected with PPE is a last resort. Electrical safety is by necessity a highly complex and technical safety discipline. When applied to a world-class energy research and development facility like Berkeley Lab, the complexity increases dramatically. As a way to manage the increased complexity, a detailed and comprehensive Electrical Safety Manual has been developed to aid in analyzing complex hazards and developing tailored controls. Additionally, all divisions are to designate either an Electrical Safety Officer (Power User Divisions) or an Electrical Safety Advocate (all other divisions). Power User Divisions are tasked with developing and implementing layered ISM systems to help deal with the complexity of the program. A Power User Division is defined as a division where electrical hazards requiring Qualified Electrical Worker support are a substantial, division-wide risk element in daily work planning. Power User Division ISM plans shall include a greater level of detail in the administrative control of electrical work planning, authorization, and supervision. This shall include the designation of a suitably competent Division Electrical Safety Officer and the development of a division-specific electrical ISM plan that directs the appropriate levels of electrical work planning, authorization, and supervision, commensurate with the risk level of the task. The Division ESO is the division-level representative of the Electrical AHJ for Safe Work Practices. While non-Power User Divisions are to designate an Electrical Safety Advocate, they may also choose to designate an Electrical Safety Officer instead. The Division ESO shall be responsible for all electrical work activities or safety procedures related to custom or special electrical equipment, and shall have detailed knowledge regarding the electrical hazard exposure, the appropriate controls for mitigating those hazards, and the implementation of those controls. The Division ESO shall be a QEW Supervisor, meeting all requirements of Work Process D. The QEW level shall be that which is most appropriate for the type of work being performed by the division. The Division ESO shall have suitable administrative capability and written technical communication skills to develop electrical work plans and permits, complex electrical Lockout/Tagout procedures, division-specific electrical policies and procedures, and electrical assessment reports as necessary to implement the requirements of the Electrical Safety Program in the daily work activities of the division. The Division ESO shall be certified as an NFPA Certified Electrical Safety Compliance Professional (CESCP), and shall remain current in this certification. In cooperation with the Electrical Safety Officer, develops the Division ISM Plan for implementing the requirements of the Electrical Safety Program. Enforces the Berkeley Lab requirements for electrical safe work practices and workplace conditions. Consults with the Electrical AHJ for Safe Work Practices for interpretation assistance as necessary. Reviews and approves Electrical Safe Work procedures for the division. Performs annual work-practice audits of all QEWs within the division, and submits written reports to the Electrical Safety Officer. Leads annual division self-assessments in the areas of Electrical Safety and Lockout/Tagout. Acts as a resource to employees, managers, and Division Safety Coordinators for electrical safety-related concerns. Reinforces good work practices to reduce at-risk behaviors. Performs or assigns workplace-condition inspections to look for electrical hazards in office, industrial, and/or laboratory spaces. Performs or assigns surveys of electrical equipment, and enters non-Nationally Recognized Testing Laboratory (NRTL) equipment into the Electrical Equipment Database for inspection. Coordinates with the Electrical Safety Group to resolve issues with electrical workplace conditions. Is familiar with relevant resources, including the Electrical Safety website, the Electrical Safety Database (QuickBase), and the Electrical Safety Manual. The Division ESA is designated by division management in accordance with the Division’s ISM Plan. The Division ESA is the division-level representative of the Electrical AHJ for the general electrical safety for all persons (Section 5 of the Electrical Safety Manual). The Division ESA may be either a Qualified Electrical Worker (QEW) or a non-QEW knowledgeable in electrical safe work practices for non-QEWs. Performs or assigns routine workplace-condition inspections to look for electrical hazards in office, industrial, and/or laboratory spaces. Performs or assigns surveys of electrical equipment, and enters non-NRTL equipment into the Electrical Equipment Database for inspection. Is familiar with relevant resources, including the Berkeley Lab Electrical Safety website, the Electrical Safety Database (QuickBase), and the Electrical Safety Manual. An electrical hazard is defined as a dangerous condition such that contact or equipment failure can result in electric shock, arc flash burn, thermal burn, or blast. Electrical Safety is defined as recognizing hazards associated with the use of electrical energy and taking precautions so that hazards do not cause injury or death. A shock hazard is a dangerous condition associated with the possible release of energy caused by contact or approach to energized electrical conductors or circuit parts. A shock hazard may exist on any system of conductors or circuit parts that is nominally energized above any one of the following thresholds in Table D-1. For more information on shock hazard classification, refer to the Electrical Safety Manual. An arc flash hazard is a dangerous condition associated with the possible release of energy caused by an electric arc. An arc flash hazard may exist on certain electrical systems but requires an arc flash hazard analysis to determine the hazard. For more information on arc flash hazard determination, refer to the Electrical Safety Manual. A Qualified Electrical Worker (QEW) is defined as one who has demonstrated skills and knowledge related to the construction and operation of electrical equipment and installations, has received safety training to identify and avoid the hazards involved, and who has been approved by the Electrical AHJ for Safe Work Practices. Conversely, any person who is not a QEW is called a non-QEW. Demonstrated skills and knowledge refer to the electrical work experience and formal electrical theory education of a particular individual. The Berkeley Lab Electrical Safety Program does not impart either skills or knowledge related to construction or operation of equipment. Instead, it is expected that such training is provided by line management or a prerequisite in the hiring process outlined in the position description. The Electrical Safety Program only verifies that the individual has received such training and that it matches the type of work to be performed. Safety training is a core function of the Electrical Safety Program. Once skills and knowledge have been vetted, an individual is assigned electrical safety training classes that must be completed in order to maintain QEW status. Electrical work is defined as any task that involves a shock or arc flash hazard or could create potential shock or arc flash hazards for future users. This includes both live and deenergized work for building, servicing, maintaining, and repairing equipment. For differentiation on what constitutes electrical work, see the Electrical Safety Manual. Only QEWs who are approved by the Electrical AHJ for Safe Work Practices may be authorized to perform electrical work (subject to exceptions below). In addition, all persons who plan or direct electrical work shall be QEWs of the same level as the work being planned or directed. Performance of non-electrical work (such as mechanical work or work on electrical circuits below the shock hazard thresholds of Table D-1) does not require a QEW. The equipment meets the requirements for the cord-and-plug exemption to Lockout/Tagout (LOTO) in accordance with the Berkeley Lab ES&H Manual Lockout/Tagout Program, Work Process C, Cord-and-Plug Equipment. A QEW provides direct field supervision of any electrical work performed while equipment is unplugged. Personnel are trained and authorized by their line management to perform the work on that specific equipment. A QEW places the equipment in an Electrically Safe Work Condition. All persons join the LOTO in accordance with the Berkeley Lab ES&H Manual Lockout/Tagout Program. The QEW provides direct field supervision of any electrical work performed while in an Electrically Safe Work Condition. The QEW performs Test Before Touch every time job continuity is interrupted. These exceptions also apply to non-construction subcontractors, although with modifications. See Work Process G.
QEWs shall be classified in accordance with Table D-2, depending primarily on the type of utility power feeding the equipment they work upon. The QEW 1 Level is primarily designed for researchers who commonly perform service-level work on laboratory utilization equipment. This level is what would typically be suitable for service technicians assigned to perform preventive maintenance and repair work to a variety of instruments such as electron microscopes, thermal evaporators, lasers, ion sources, and a myriad of scientific instrumentation. The QEW 2 Level is primarily designed for crafts persons, technicians, and engineers where performing electrical work is a primary job responsibility and interacting with premises wiring equipment is a common task. Arc flash hazards may or may not be present, and the QEW 2 is expected to recognize and mitigate such hazards. Facilities electricians, Facilities HVAC workers, Electrical Engineers, and some Electronics Technicians normally operate at this level of qualification. The QEW 3 Level is reserved for personnel assigned to work on Facilities high-voltage utilities and distribution equipment with high levels of available fault current. Some programmatic equipment that operates at this level is also included. However, this does not include R&D high-voltage power supplies. QEW R Level is for specialized applications where the researcher is the principal subject matter expert on the exposure type. The QEW R is not exposed to line-source power hazards. Determination of an arc flash hazard for the purposes of QEW level determination shall be done in accordance with the Electrical Safety Manual. A QEW 2 can be authorized to perform work on QEW 1 Level equipment. A QEW 3 can be authorized to perform work on QEW 2 and QEW 1 Level equipment. Subcontractors are also assigned these QEW levels in accordance with Work Process F and Work Process G.
QEWs shall be further classified as “supervised” or “unsupervised,” depending on whether they receive daily supervision from a supervisor or work lead who is also a QEW. This person is called a “QEW Supervisor.” This classification determines the frequency of work practice inspections. The QEW Supervisor must be a QEW of the same level as the QEW being supervised. Where required due to elevated hazards or increased complexity of the work, develop written electrical safe work plans with step-by-step instructions. Berkeley Lab QEWs shall require approval by the Electrical AHJ for Safe Work Practices. For QEW R, the approval is done at the Activity level in WPC. The approval process requires submittal of documented credentials attesting that the applicant has sufficient work experience to substantiate adequate skills and knowledge related to the type of equipment to be worked upon. To apply for consideration as a QEW, click here and follow the instructions in the application. Approved applicants are then directed to complete the required safety training and certification for their assigned QEW classification (Work Process I). QEW training may be started prior to AHJ approval as QEW. Upon satisfactory completion of the safety training and certification, the applicants are designated as Berkeley Lab–approved QEWs. All QEWs must remain current in assigned safety training courses and certification to retain their QEW status. An employee who is undergoing on-the-job training for the purpose of obtaining the skills and knowledge necessary to be considered a QEW and who, in the course of such training, has demonstrated an ability to perform specific duties safely at his or her level of training, and who is under the direct field supervision of a QEW, shall be considered to be a QEW for the performance of those specific duties. Persons working as QEWs under instruction shall have completed the required electrical safety training in Work Process I. This applies to apprentices as well as other types of electrical instruction for researchers. The Electrical AHJ for Safe Work Practices shall maintain a database roster of all Berkeley Lab QEWs. The database shall retain submitted documentation that substantiates the credentials for QEW skills and knowledge. QEW training completion is tracked in the EHS Training Records database. Upon AHJ approval and completion of required training and certification, QEWs 1, 2, and 3 will receive a QEW badge that includes name, photo, and level of qualification. QEWs shall carry the badge with their employee badge and shall present it for examination upon request. No badge is issued or required for QEW R. See Appendix C for images of badge types. The Electrical AHJ for Safe Work Practices may impose additional restrictions on the QEW Level approval. The applicant, the QEW Supervisor, or the Division ESO may also request restrictions at the time of the application. For example, a QEW Level 2 may be restricted to visual inspection and voltage testing, and not be approved for service, repair or building of electrical circuits. Restrictions shall be documented in the QEW database and displayed on the QEW badge. Regardless of QEW Level, QEWs shall not be authorized to perform duties for which their QEW Level has been restricted. All construction subcontractors who perform electrical work as defined in Work Process D shall be required to be accepted by the Electrical Authority Having Jurisdiction (AHJ) for Safe Work Practices as Subcontractor Qualified Electrical Workers (QEWs). This includes both live and deenergized work for building, servicing, maintaining, and repairing equipment. A QEW is required for all connected work, even if under Lockout/Tagout (LOTO). This is because they need to know how and when to Test Before Touch for themselves. A QEW is not required for rough-in work or for equipment protected by Air Gap. Note that the restrictions on Air Gapping apply and are listed in the Lockout/Tagout Program, Work Process Q, Air Gapping. Air Gapping is not a substitute for LOTO. “Accepted” in this Work Process F means that the AHJ has reviewed the Subcontractor Employer’s Statement of QEW Approval, accepted it as valid for use at Berkeley Lab, and the applicant has demonstrated proficiency by passing the practical certification examination. However, it is the responsibility of the Subcontractor Employer to approve their personnel as QEWs for their work, in accordance with their Subcontractor Electrical Safety Program. These requirements cascade down to all sub-tiered contractors of a general contractor, including vendors, Original Equipment Manufacturer (OEM) representatives, etc. Sub-tiered contractors and others may apply for AHJ acceptance under another subcontractor’s electrical safety program only if they were trained and qualified by that subcontractor under the same plan. If this is not the case, then the sub-tiered contractors must also submit their own electrical safety program for review. A copy of the Subcontractor’s Electrical Safety Program, which Berkeley Lab will retain on file. Contact information (phone number and email) of the subcontractor’s safety representative who can address questions and concerns that might come up during the course of work at Berkeley Lab. Type and length of job experience, basically describing why the person is considered to have the required experience for the tasks in the scope of work. Any restrictions on their scope of work (such as voltage or type of equipment). Confirmation of NFPA 70E electrical safety training for each employee. The training shall consist of classroom or on-the-job instruction, a minimum of 8 hours, and taken within the last 36 months. Training shall also include a practical demonstration of the absence of voltage verification, with the selection of an appropriately rated voltage detector and appropriately rated PPE. Confirmation of current First Aid/Cardiopulmonary Resuscitation (CPR)/Automated External Defibrillator (AED) training with expiration date for a minimum of 50% of QEWs from any given subcontractor on any given scope of work. In all cases, there shall be at least one Subcontractor QEW with current First Aid/CPR/AED training available to provide rescue in the case of an incident. Further, CPR/AED training shall comply with the American Heart Association or American Red Cross CPR and AED guidelines and shall include a competency demonstration of skills on a manikin, directly observed by an instructor (see California Code of Regulations [CCR] Title 22 Division 9 Sections 100038 and 100039). State of California electrician’s license number and type, if applicable. This certification shall be for “general electrician” unless otherwise approved by Berkeley Lab for specific jobs where a general electrician’s certification is not necessary. The EHS Electrical Safety Group will collaborate with Facilities Division Responsible Individuals to gather the required submittals. The Facilities Division Electrical Safety Officer will review the submitted documents. Suitable submittals will be forwarded to the AHJ with a recommendation for acceptance. More information may be requested about the supporting electrical safety program, training records, PPE specifications or a particular individual’s experience. Accepted submittals will be entered into the Berkeley Lab EHS registry of Qualified Electrical Workers by the EHS Electrical Safety Group. Subcontractor QEWs will be assigned a QEW Level in accordance with Work Process D, Table D-2. The apprentice is under the direct field supervision of a QEW Journeyman. “Direct field supervision” means that the QEW Journeyman is present on site and overseeing the work, and is close enough to the apprentice to physically intervene to prevent an unsafe act. The Electrical AHJ for Safe Work Practices reserves the right to revoke a subcontractor’s status as a Qualified Electrical Worker at any time when actions and behaviors pose a risk to themselves or others, or otherwise cause a concern that the worker is not in fact qualified for the task being performed. This authority is also delegated to the Deputy and Division Electrical Safety Officers. Additionally, the Electrical AHJ for Safe Work Practices also reserves the right to revoke the Qualified Electrical Worker status for all of the subcontractor’s workers if systemic deficiencies with the effectiveness of the Subcontractor Electrical Safety Program are discovered during the course of work. Construction Subcontractor QEWs shall complete EHS0581, Construction Subcontractor Electrical Safety Site-Specific Training initially, and once every three years. This training will communicate in detail Berkeley Lab specific policies and procedures for the control of electrical work. Subcontractor QEWs who routinely perform work at Berkeley Lab are encouraged to take the training for Berkeley Lab QEWs listed in Work Process I of this program. This practical certification is the same as that administered to Berkeley Lab employees applying for certification as a QEW in Work Process I. It is a validation that the applicant can properly recognize hazards to which they might be exposed and select and implement appropriate safety controls in accordance with the Laboratory’s Electrical Safety Program. Parameters of the certification include demonstrating key electrical safe work practices, including selection, inspection, and wearing of personal protective equipment (PPE), identification of approach boundaries, setting control barricades and zero voltage verification. The practical certification is administered onsite by the Electrical Safety Group and must be scheduled in advance. As for all employees, the practical certification must be renewed annually. 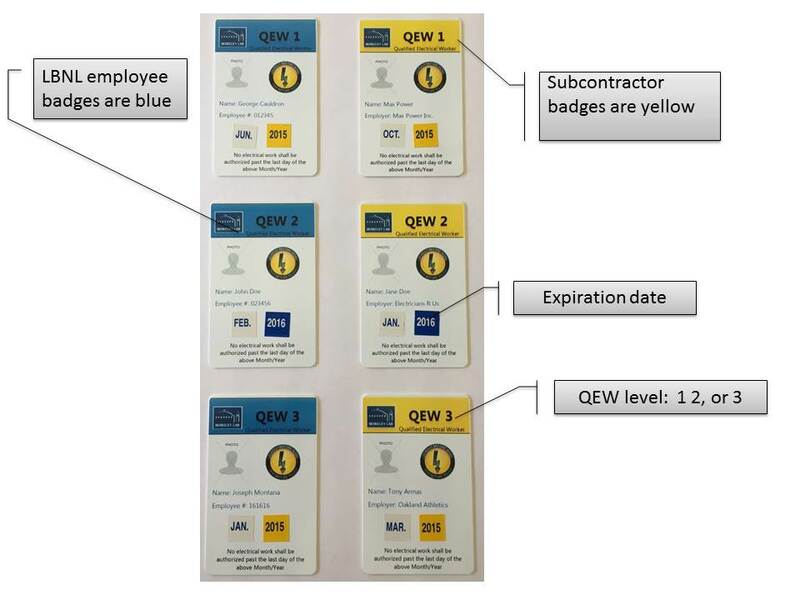 Upon successful completion of the practical certification, subcontractor QEW’s shall be issued a QEW badge as shown in Appendix C.
Vendors who are not construction electricians but who are working for construction subcontractors may be considered under the acceptance rules for non-construction subcontractors. Non-Construction Subcontractors include vendors, Original Equipment Manufacturer (OEM) technicians, service representatives, and other personnel typically tasked with servicing equipment. Non-Construction Subcontractors must be covered under a Subcontractor Job Hazards Analysis (sJHA) in accordance with the Berkeley Lab sJHA Process – Subcontractor Job Hazards Analysis policy. This process will trigger the recognition of electrical work and the requirement for Qualified Electrical Worker (QEW) acceptance by the Authority Having Jurisdiction (AHJ). All non-construction subcontractors who perform electrical work as defined in Work Process D shall be required to be accepted by the Electrical AHJ for Safe Work Practices as Subcontractor Qualified Electrical Workers (QEWs). This includes both live and deenergized work, for building, servicing, maintaining, and repairing equipment. The equipment meets the requirements for the cord-and-plug exemption to LOTO in accordance with the Lockout/Tagout Program, Work Process C, Cord-and-Plug Equipment. The non-construction subcontractors are trained and authorized by their employer to perform the electrical work on that specific equipment. All non-construction subcontractors join the LOTO Permit in accordance with the Lockout/Tagout Program, Work Process I, Subcontractor LOTO Permit. The non-construction subcontractors are trained and authorized by their employer to perform the work on that specific equipment. Performance of non-electrical work (such as mechanical work or work on electrical circuits below the shock hazard thresholds of Work Process D, Table D-1) does not require a QEW. See Work Process D and the Electrical Safety Manual for more information on what constitutes electrical work. “Accepted” in this Work Process G means that the AHJ has reviewed the Subcontractor Employer’s Statement of QEW Approval, accepted it as valid for use at Berkeley Lab, and the applicant has demonstrated proficiency by passing the practical certification examination. However, it is the responsibility of the subcontractor employer to approve their personnel as QEWs for their work. These requirements cascade down to all sub-tiered contractors of a prime contractor, including vendors, OEM representatives, etc. If available, a copy of the subcontractor’s electrical safety program, which Berkeley Lab will retain on file. Confirmation of NFPA 70E electrical safety training for each employee. The training shall consist of classroom or on-the-job instruction, a minimum of 4 hours (if no arc flash hazard) or 8 hours (if arc flash hazard) long, and taken within the last 36 months. Training shall also include a practical demonstration of absence of voltage verification, with selection of an appropriately rated voltage detector and appropriately rated personal protective equipment (PPE). Confirmation of current First Aid/CPR/AED training with expiration date for at least one person if more than one person is assigned. The EHS Electrical Safety Group will collaborate with the sJHA point of contact to gather the required submittals. The Deputy Laboratory Electrical Safety Officer, or the Division Electrical Safety Officer, as applicable, will review the submitted documents. Suitable submittals will be forwarded to the AHJ with a recommendation for acceptance. More information may be requested about the supporting electrical safety program, training records, PPE specifications, or a particular individual’s experience. Accepted submittals will be entered into the Berkeley Lab Environment/Health/Safety (EHS) registry of QEWs by the EHS Electrical Safety Group. The apprentice is under the direct field supervision of a QEW Journeyman. Direct field supervision means that the QEW Journeyman is present on site and overseeing the work, and is close enough to the apprentice to physically intervene to prevent an unsafe act. The Electrical AHJ for Safe Work Practices reserves the right to revoke a subcontractor’s status as a QEW at any time when actions and behaviors pose a risk to themselves or others, or otherwise cause a concern that the worker is not in fact qualified for the task being performed. This authority is also delegated to the Deputy and Division Electrical Safety Officers. Additionally, the Electrical AHJ for Safe Work Practices also reserves the right to revoke the QEW status for all of the subcontractor’s workers if systemic deficiencies with the effectiveness of the Subcontractor Electrical Safety Program are discovered during the course of work. Non-Construction Subcontractor QEWs shall complete an online class, EHS0582, Non-Construction Subcontractor Electrical Safety Orientation at Berkeley Lab, initially and on an annual basis. Subcontractor QEWs who routinely perform work at Berkeley Lab are encouraged to take the training for Berkeley Lab QEWs listed in Work Process I. This practical certification is the same as that administered to Berkeley Lab employees applying for certification as a QEW in Work Process I. It is a validation that the applicant can properly recognize hazards to which they might be exposed and select and implement appropriate safety controls in accordance with the Laboratory’s Electrical Safety Program. Parameters of the certification include demonstrating key electrical safe work practices, including the selection, inspection, and wearing of PPE; identification of approach boundaries; setting control barricades; and zero-voltage verification. The practical certification is administered on-site by the Electrical Safety Group and must be scheduled in advance. As for all employees, the practical certification must be renewed annually. QEW 3 Subcontractors with a documented Electrical Safety Program that incorporates a standardized practical certification shall not be required to take EHS0562, provided that they submit relevant documentation of an annual certification for each individual. All subcontractors who perform work on hazardous electrical equipment shall first be required to be accepted by the Electrical Authority Having Jurisdiction (AHJ) for Safe Work Practices as Subcontractor Qualified Electrical Workers (QEWs) in accordance with Work Process F or Work Process G. This includes both live and deenergized work for building, servicing, maintaining, and repairing equipment. All subcontractors performing work for Berkeley Lab are required to conform to the Berkeley Lab ES&H Manual Lockout/Tagout (LOTO) Program. This Work Process H contains additional requirements to ensure that subcontractors are adequately managed and protected from hazardous electrical energy exposures. Electrical work planning and control shall conform to ESM Section 6, Electrical Safe Work Controls. Shock hazard analysis and selection of shock protection personal protective equipment (PPE) shall conform to ESM Section 7, Shock Protection. Arc flash hazard analysis and selection of arc flash protection PPE shall conform to ESM Section 8, Arc Flash Protection. Absence of voltage testing shall conform to ESM Section 9, Testing for the Absence of Voltage. All Lockout/Tagout shall be performed in accordance with the Berkeley Lab ES&H Manual Lockout/Tagout Program, Work Process I, Subcontractor LOTO Permit. All electrical conductors and circuit parts are assumed to be energized until they have been de-energized, tested, locked, and tagged with an approved Subcontractor LOTO Permit. Subcontractor Energized Electrical Testing Permits (EETP). Subcontractor employees are not permitted to be within the Limited Approach Boundary of uninsulated energized electrical parts without an EETP. This includes testing, troubleshooting, inspecting, and nonelectrical work within the Limited Approach Boundary. You can obtain an EETP by contacting the Berkeley Lab Responsible Individual. Do not open covers on energized equipment without first obtaining an EETP. LOTO verification testing is treated as energized work, but is covered by the LOTO permit. An EETP is not required. Once the EETP has been approved, it will be printed out by your Responsible Individual. The Responsible Individual will conduct a briefing with all of the workers, explaining to them the scope of the EETP and their respective roles and responsibilities. Subcontractors must comply with all terms, the scope, and conditions stated on the permit. Any changes to the EETP must be routed through the Electrical Safety Group for approval. The permit may not be used beyond the expiration date. All work under the permit must be completed by the expiration date. If an extension is required, contact the Electrical Safety Group. The permit is to remain posted on the job site and be produced at anyone’s request. When the work has been completed, give the permit to the Responsible Individual for transmittal to the Electrical Safety Group. More information on the EETP can be found in the ESM, Section 6, Electrical Safe Work Controls. Construction or non-construction crews that have a designated subcontractor foreman for the job shall conduct electrical safety toolbox meetings daily and before the start of work. Live voltage verification for both their contact voltage tester and their proximity voltage tester. The daily briefing will be documented with a sign-in sheet that will be made available upon request. In accordance with the Berkeley Lab Working Alone Policy, workers at Berkeley Lab are not allowed to work alone when the mitigated hazards associated with their work could incapacitate them such that that they could not "self-rescue" or activate emergency services. This includes when an individual may receive severe electrical shock or arc flash injury. Working alone is defined as when a worker performs electrical work out of sight and earshot of anyone who can help in the event of an emergency. Working accompanied is defined as when a worker performs work with a Standby Person or a Safety Watch. If either the Standby Person or the Safety Watch has to leave the area, the activity is considered to be Working Alone, and must terminate if prohibited in the work authorization. Certain types of work require a Standby Person or a Safety Watch. Refer to the Electrical Safety Manual for when either is required. It is the subcontractor’s responsibility to assign a person suitably qualified to perform the duties of Standby Person or Safety Watch. With prior approval, Berkeley Lab may agree to provide the person instead. A Qualified Electrical Worker (QEW) shall be trained and knowledgeable of the construction and operation of equipment or a specific work method and shall be trained to recognize and avoid the electrical hazards that might be present with respect to that equipment or work method. A QEW can be considered qualified with respect to certain equipment and methods but still be unqualified for others. QEWs shall also be familiar with the proper use of the special precautionary techniques; personal protective equipment (PPE), including arc flash suit; insulating and shielding materials; and insulated tools and test equipment. Any person who is undergoing on-the-job training for the purpose of obtaining the skills and knowledge necessary to be considered a QEW and who, in the course of such training, has demonstrated an ability to perform specific duties safely at his or her level of training, and who is under the direct field supervision of a QEW, shall be considered to be a QEW for the performance of those specific duties. Direct field supervision means that a designated competent QEW is present on site and is providing oversight, guidance, and instruction on a specific task or set of tasks to another QEW. QEW 1/2/3 who do not have provisional QEW (PQEW) approval, but who are training under instruction to achieve PQEW approval may receive limited AHJ approval provided that they have completed all of the required safety training (with the exception of the practical certification) and are working under direct field supervision of a QEW. QEWs that are under instruction do not count towards the electrical safety watch requirements of the Electrical Safety Manual. Employees shall be trained to select an appropriate voltage detector and shall demonstrate how to use a device to verify the absence of voltage, including interpreting indications provided by the device. The training shall include information that enables the employee to understand all limitations of each specific voltage detector that might be used. Regardless of QEW classification, QEWs shall not perform work on unfamiliar equipment without first receiving applicable training on the construction, operation, maintenance, and troubleshooting of the electrical equipment. In addition to the training requirements of Table I-1, below, all QEWs will be trained as Lockout/Tagout (LOTO) Authorized Persons or LOTO Responsible Individuals in accordance with the Berkeley Lab ES&H Manual Lockout/Tagout Program, and shall complete the required reading in the Required Reading List. Training requirements and practical certifications for QEWs shall follow the training matrix in Tables I-1a, I-1b, and I-1c and I-1d. A complete list of training courses is in Appendix D.
This section applies to supervisors or work leads of QEWs who are themselves QEWs. QEW Supervisors shall be qualified at least at the same level as the QEWs whom they supervise. QEWs who are supervised by a supervisor who is qualified at a lower level shall be considered unsupervised for the purpose of practical recertification periodicity. Training requirements for QEW Supervisors shall follow the training matrix in Table I-3. QEW Supervisors shall be evaluated on their ability to oversee a QEW Practical Certification for the appropriate QEW level. QEW Supervisors shall also be required to remain current on the Required Reading List maintained by the Electrical Safety Officer. The training requirements in Tables I-1, I-2, and I-3 shall be repeated at the specified intervals. However, First Aid and CPR/AED training shall be repeated at intervals not to exceed two years. The practical training and certification in Table I-2 shall be repeated at intervals not to exceed 36 months and shall be contingent on completion of required reading in the Required Reading List. QEWs who are not directly supervised by a person who is also a QEW shall repeat the practical certification every 12 months but shall not be required to repeat the classes in Table I-3 or the practical training in Table I-2. Tasks that are performed less often than once per year shall require task specific retraining before the performance of the work practices involved. This can be formal retraining, on-the-job training, or direct field supervision by someone with current experience in the task. QEW badges for QEWs 1/2/3 include tamper-resistant date stickers (month/year) indicating the expiration date that occurs earliest. QEWs have until the end of that calendar month to complete all training refresher or renewal. At the beginning of each month, AHJ approval status (credit for EHS0545/557/563) will be revoked for individuals that are not up to date on training. AHJ approval status will be regranted once all training requirements are satisfied again. QEWs without credit for EHS0545/557/563 shall not be authorized to perform electrical work in WPC. The work authorization status shall be set to “Not authorized to work” until training requirements are satisfied and credit for EHS0545/557/563 is restored. QEWs with expired badges shall not be authorized to perform electrical work. QEWs who need sticker renewal should come by the EHS Electrical Safety Group office. QEW R retraining will be set directly at the activity level. QEW Rs shall not be authorized to perform electrical work with expired training. A Required Reading List shall be maintained by the Laboratory Electrical Safety Officer. The list will track completion of mandatory reading assignments for individuals depending on QEW level and responsibility. This will be done by self-certification on a database. Topics will include relevant sections of the Electrical Safety Manual, changes to policy or procedure, incident notifications and investigation reports, recall notices, and other suitable material designed to improve worker knowledge and awareness of electrical hazards. The completion of required training shall be documented in the Berkeley Lab Training Database. The Electrical Safety Group shall verify that all training is current at least annually. A Non-Qualified Electrical Worker (non-QEW) is any person who is not a Qualified Electrical Worker (QEW). Personnel who work in laboratory or technical spaces shall, at a minimum, take EHS0260, Electrical Safety for Non-QEW Lab Personnel at intervals not to exceed three years. Non-QEWs who perform non-hazardous switching on premises wiring panelboards or any circuit breaker or fused disconnect rated at 15 Amps or greater shall take EHS0536, Electrical Switching Safety for Non-QEWs at intervals not to exceed three years. Non-hazardous switching is defined as the manual opening or closing of any electrical isolation where there is no shock or arc flash hazard. See the Electrical Safety Manual for more information. Non QEWs who perform work with low hazard capacitors must fulfill the online course EHS0534, Capacitor Safety for non-QEWs. Non-QEW Line Managers who supervise Qualified Electrical Workers must fulfill the online course EHS0580, Electrical Safety Awareness for Line Management at intervals not to exceed three years. For matrixed QEWs, this applies to both the line manager in the host and the home divisions. Electrical Safety Advocates (ESA’s) who are not QEWs must take EHS0268, Introduction to LBNL Electrical Safety Program, at intervals not to exceed three years. Construction Managers must take EHS0581, Construction Subcontractor Electrical Safety Site-Specific Training, at intervals not to exceed three years. STOP!! Do not touch the person. Look for the hazard. Shut off power and/or rescue the person with non-conductive object if safe to approach. Call 911 from a landline. Get an Automated External Defibrillator (AED). If necessary start CPR and apply AED as soon as possible. Barricade and control access. Complete the Electrical Injury Notification. All electrical shocks, however minor, shall be immediately reported to the line manager and to Health Services at ext. 6266. All persons experiencing an electrical shock are to receive appropriate medical evaluation. Exception: normal static electricity shocks from carpets and similar sources need not be reported. Follow the reporting requirements of the Berkeley Lab ES&H Manual Health Services program, Section 3.15, Medical Emergencies and First Aid. The Lab ESO will determine the severity of the incident by calculating the electrical severity score in accordance with Appendix E.
The plug(s) remain(s) under the exclusive control of the worker performing the work. Under the exclusive control of the worker means that the authorized person has the authority to and is continuously in a position to prevent (exclude) other individuals from re-energizing or starting the machine or equipment while performing the servicing or maintenance activity. For cord-and-plug equipment that does not meet the exemption requirements, the LOTO process shall be applied, and ZVV may be required. If there is stored energy above hazardous thresholds, such as capacitors 100 V or greater and 10 Joules or greater, a Complex LOTO Procedure must be used. This will require a QEW and ZVV. If exclusive control cannot be established and there is a single plug and no stored energy, a Simple LOTO may be used. If, however, there are multiple cords, a Complex LOTO Procedure must be used. Neither a QEW nor ZVV is required. Personnel who are not qualified electrical workers (non-QEWs) may perform certain types of work on cord-and-plug equipment when meeting the requirements of ES&H Manual Lockout/Tagout Program, Work Process C.
Inspection of the interior of the equipment. Replacement of fuses or other like-for-like parts intended to be replaced by a user of the instrument (e.g., light bulbs, ion gauges, plug and play circuit boards, etc.). Replacement of electrical components that are not intended to be replaced by the user. Replacement of power cords and/or cord caps (plugs). Alteration of bonding/grounding within the equipment. A non-QEW may never perform any work, including inspection or voltage testing, on energized equipment with exposed energy sources above those in Table D-1, or on energized equipment where the energy of exposed conductors is unknown. 29 CFR 1910.137 - Electrical protective devices. 29 CFR 1910.147 - The control of hazardous energy (lockout/tagout). 29 CFR 1910.269 - Electric Power Generation, Transmission, and Distribution. Click on the following links to view the current AHJ delegation letters. The following is the Code of Record table for NFPA 70E. The 2004 edition was adopted when 10 CFR 851 became effective. The following is the Code of Record table for NFPA 70, National Electric Code (NEC). The 2005 edition was adopted when 10 CFR 851 became effective. Note that specific projects may have a different code of record depending on the date the contract was approved, not necessarily when the project was constructed. Contact the Electrical AHJ for Safe Installation for more detail. The Electrical Severity Score calculation tool establishes a standardized approach for tracking and trending electrical energy events, and is shared by all DOE labs in the complex. Specifically this approach provides a method to determine the severity of an electrical event and to measure performance over a period of time. This tool is not intended to cover all factors that contribute to an electrical event. For example, it does not take into account: (a) training; (b) work control (except for establishing an electrically safe work condition and wearing proper PPE); and, (c) equipment maintenance. The intent of this tool is to provide a relative ranking of the severity of the event to electrical hazards. This tool should be used without speculation on what could have occurred, or "what ifs." It is intended to give a quantitative, reproducible score of an event, no matter where or when it occurred. Ideally, this tool should give the same result regardless of the user. Any unexpected or unintended personal contact (burn, injury, etc.) with an electrical hazardous energy source (e.g., live electrical power circuit, etc.). Any unexpected discovery of an uncontrolled electrical hazardous energy source (e.g., live electrical power circuit, etc.). This criterion does not include discoveries made by zero-energy checks and other precautionary investigations made before work is authorized to begin. Any failure to follow a prescribed hazardous electrical energy control process (e.g., Lockout/Tagout, Hazardous Energy Control Program). The thermal burn equation is rarely used, and is limited to when a worker receives a direct contact burn with hot metal. Note that there cannot be both an Arc Flash Proximity Factor and a Thermal Proximity Factor when performing the evaluation. The ES equation generates scores from 0 to 310,000. This range provides an exponentially rising severity that, when based on a logarithmic scale, breaks down into three categories of significance: High, Medium, and Low. Electrical Hazard Factor: The Electrical Hazard Factor is determined by classifying the source of electrical energy that the worker was exposed to during the event and then assigning a value to it, based on the Electrical Hazard Classification Charts found in the Electrical Safety Manual. The Environment Factor is determined by analyzing the environmental condition found in the area of the event. The Environment Factor is determined in order to assess the level of severity at the time of the event. Human skin resistance can vary considerably from a dry location to one that contains conductive fluids (e.g., end-mill misters present in a machine shop). If the proper PPE is used while performing work, this factor can be reduced to zero (refer to the PPE Mitigation section). Dry is indoors, unless otherwise noted. Damp is outdoors, unless otherwise noted. Wet is assumed when water, snow, or other conductive liquids are involved. Examples: Outdoors can be dry, in certain arid climates, and Indoors can be wet, in work conditions involving conductive fluids. Shock Proximity Factor: The Shock Proximity Factor is determined by performing a Shock Hazard Analysis, in accordance with the Berkeley Lab Electrical Safety Manual. Arc Flash Proximity Factor: The Arc Flash Proximity Factor is determined by performing an Arc Flash Hazard Analysis, in accordance with the Berkeley Lab Electrical Safety Manual. The Thermal Proximity Factor is determined by performing a Thermal Hazard Analysis by analyzing whether a conductive media came into contact with an energized source. The hazard to the worker in this case is a thermal one, (e.g., burn received from holding a wrench that came into contact with a high current energy source). The severity is determined by human contact with the conductive media and the power available to the contacting media. Reduces the appropriate factor(s) to zero when the proper equipment and/or appropriately rated PPE is used. “Appropriately rated PPE” means that it is designed and manufactured to protect the worker from the electrical hazard associated with that factor and has been tested and certified (if applicable) to do so. The type and ratings (if applicable) of PPE are determined. Proper equipment means that the equipment being used has been designed and manufactured to protect the worker from the electrical hazard associated with that factor. The Injury Factor is determined by the injury to the worker(s) involved in the event. A burn injury factor is assigned if the burn injury is affecting more than 5% of the body surface. “Effects on the heart” is determined by EKG or a medical examiner. The Electrical Severity Index (ESI) performance metric was developed to normalize the events against organizational work hours. The ESI should be calculated monthly. The rolling 12-month ESI average should also be calculated monthly to limit small period fluctuations. Both the monthly ESI and the rolling 12-month ESI average should be tracked graphically. The ESI is calculated when each event is weighted for severity and then averaged with other events to obtain a result representing performance. The ES is used as the weighting factor for each event in the ESI metric below. ES = the Electrical Severity calculated above for a specific event.